Step 1: Enter Name and Description. Step 2: Specify Entry Criteria. Step 3: Specify Approver Field and Record Editability Properties. Step 4: Select Notification Templates. Step 5: Select Fields to Display on Approval Page Layout. 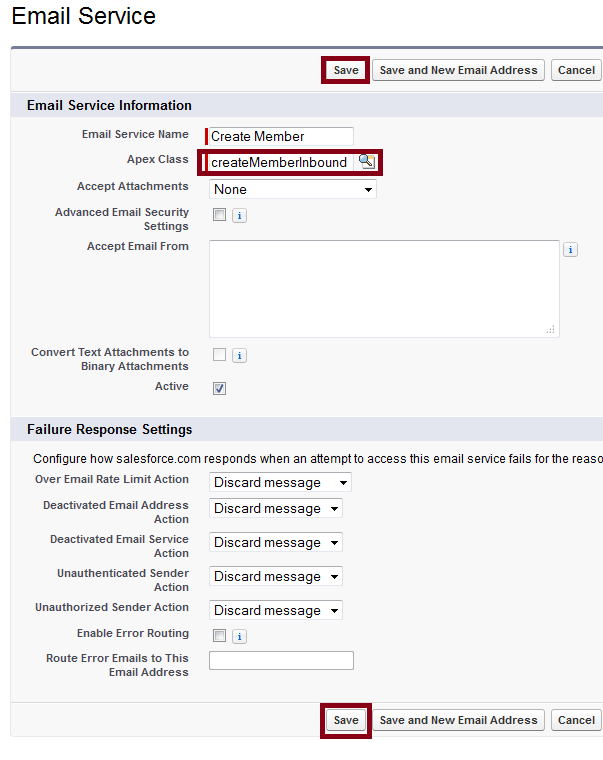 Step 6: Specify Initial Submitters. INSUFFICIENT_ACCESS_ON_CROSS_REFERENCE_ENTITY, insufficient access rights on cross-reference id: is a common issue when you try to update or create data with insufficient access on a record. Kindly check the user profile and check whether the user has access to insert/update that record. Even if the user has access, kindly check whether the user has access to update fields like record types, lookup field, master-detail field, etc. 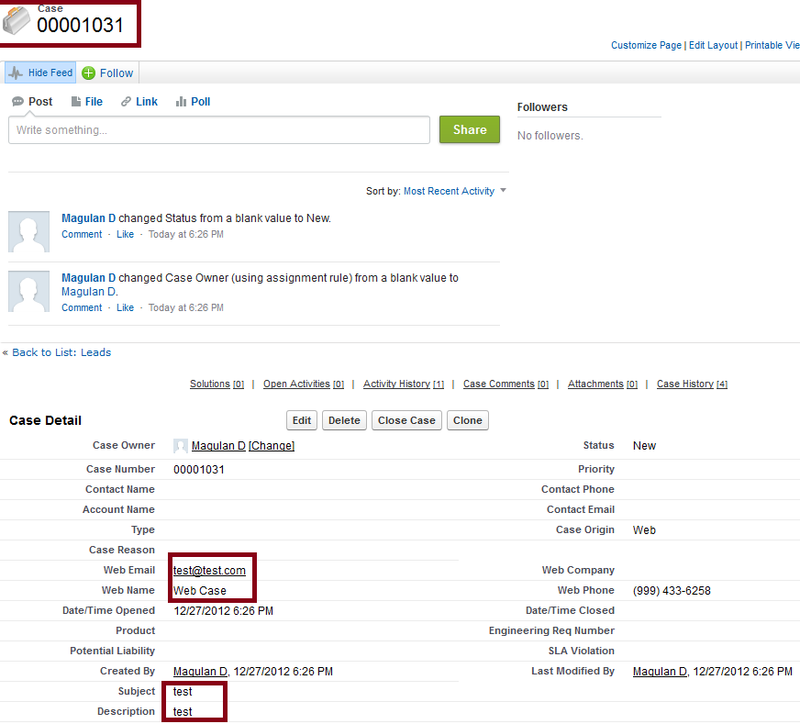 Make sure whether the user have access to record ids of the lookup fields and/or master-detail fields in the record. Check the user Profile(CRUD Permissions). Profile need to have access for the record types. 1. Go to Setup --> App Setup --> Develop --> Apex Classes. 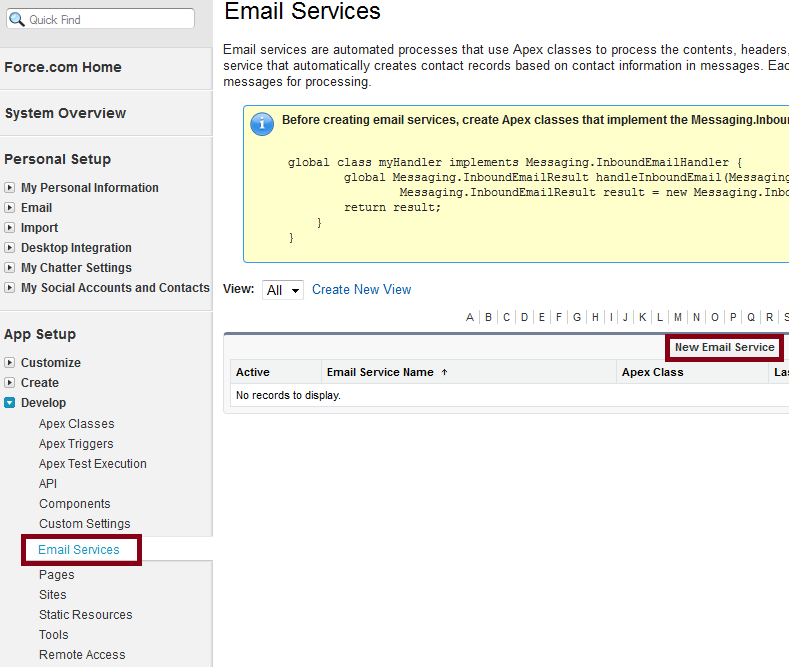 Create a class that implements the interface "Messaging.InboundEmailHandler". 2. Go to Setup --> App Setup --> Develop --> Email Services. 3. Click "New Email Service" button. 4. Fill in the details and click "Save" button. 5. Click "New Email Address" button. 6. Fill in the details and click "Save" button. 7. Copy the generated Email address. 8. 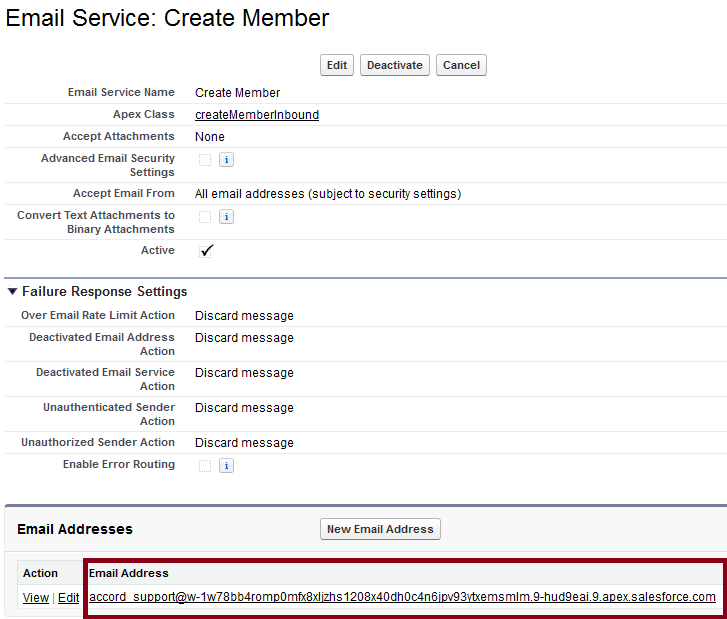 Compose an email with to address generated email address. 9. Check whether the record has been created in you Salesforce organization. 1. 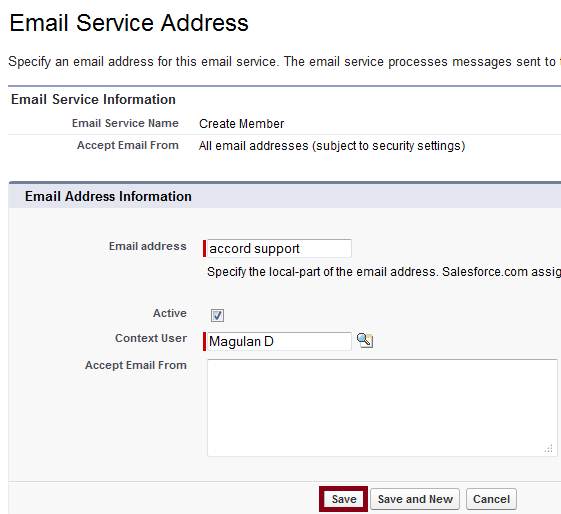 How to reset password for particular users in SaleSforce? 2. How to grant your administrator or support personnel to login as you? 3. How to find out what Salesforce edition you have? 4. How to import attachments using Apex Data Loader? 5. How to get security token in Salesforce? 6. Difference between WhoID and WhatID? 7. Difference between ISBLANK and ISNULL? 8. Difference between Sandbox and Developer Edition? 9. 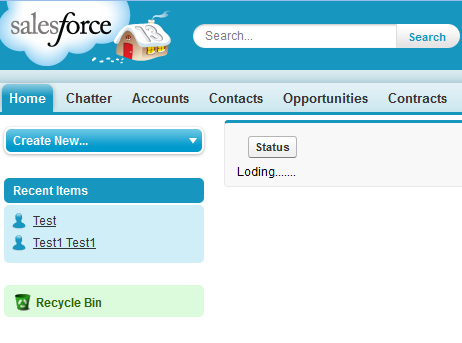 How to get fields for sObject using Apex?Apex and Visualforce? 10. 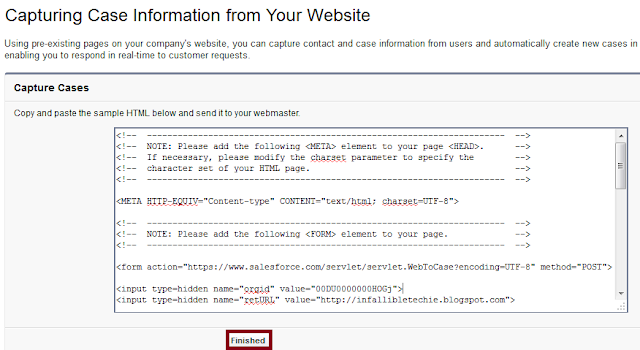 How to truncate string using apex in Salesforce? 11. How to get Salesforce.com Organization ID? 12. How to convert sObject to String in Apex? 13. How to free list memory using apex? 14. How to get a subquery field value using Apex? 15. How do I configure proxy settings for Java? 16. 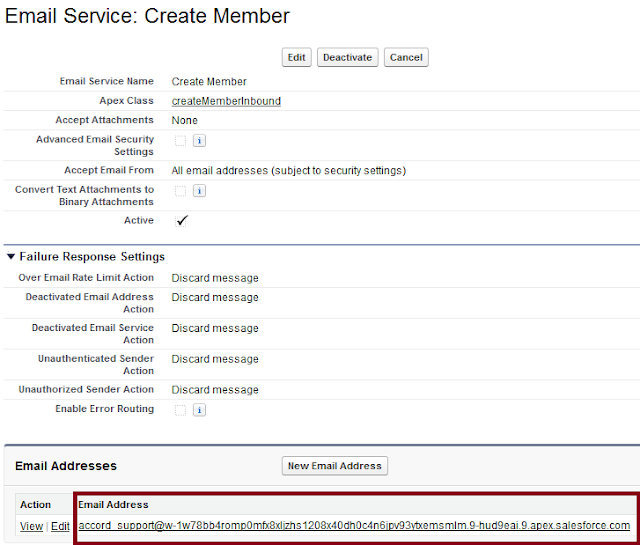 How to send email to a public group using apex? 1. How to add Row limit and Dashboard settings for Tabular report? 2. How to find total no of records using SOQL? 3. How to use a list variable in SOQL? 4. How to edit Report folder? 5. How to schedule export? 6. How to get values from apex:inputField in controller? 8. 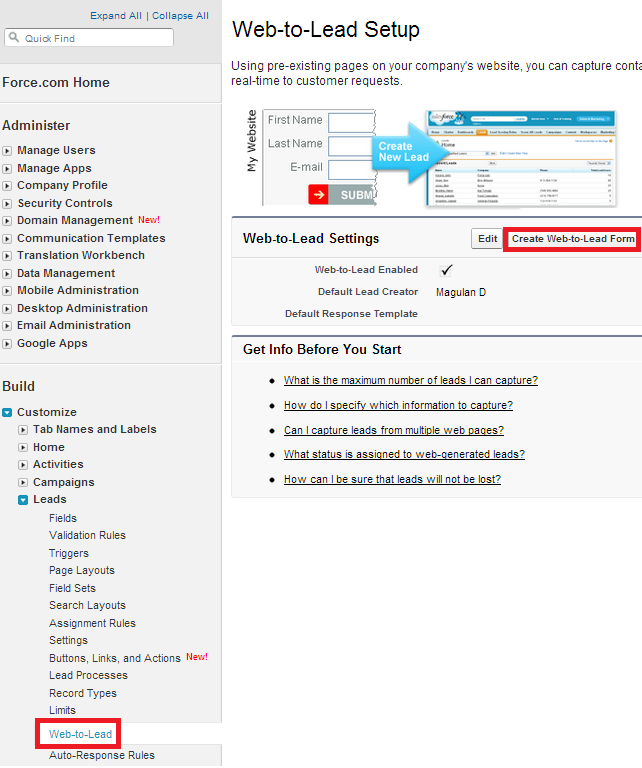 How to use Custom Labels in Visualforce page and Apex? 9. How to schedule a report? 10. How to display multiple Dashboards in home page? 11. 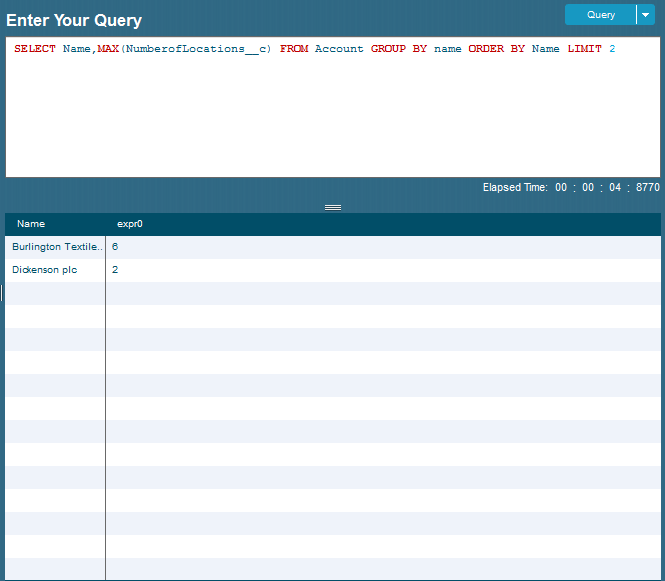 How to track field history in Salesforce? 12. 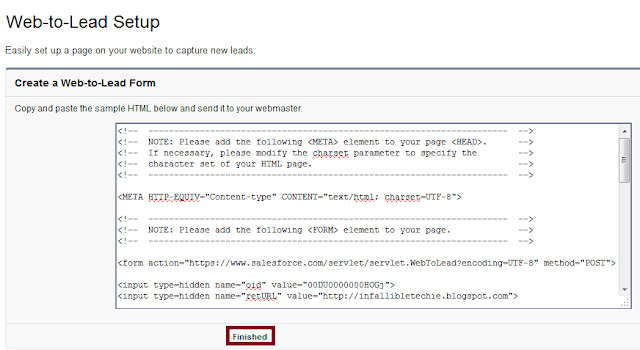 How to convert lead using Apex? 13. How to create Sandbox? 14. How to make approval process active? 15. How to execute SOQL query in Developer Console? Using a simple web form, we can allow our customers to submit cases directly to our customer support group on-line. These cases will be automatically created in salesforce.com. 1. Go to Setup --> Build --> Customize --> Self-Service --> Web-to-Case. 2. Click the "Generate the HTML" link. 3. 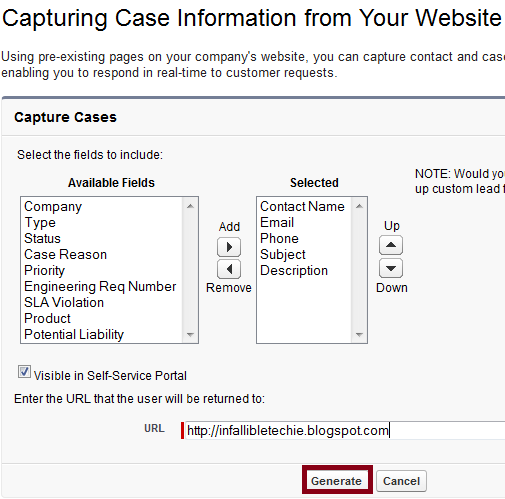 Select the required fields and enter the return URL and click "Generate" button. 4. Copy and paste the HTML generated in your blog or website. 6. Go to the form created using generated HTML in your blog or website. 7. 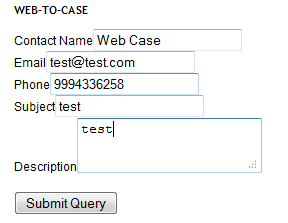 Click "Submit Query" button. 8. 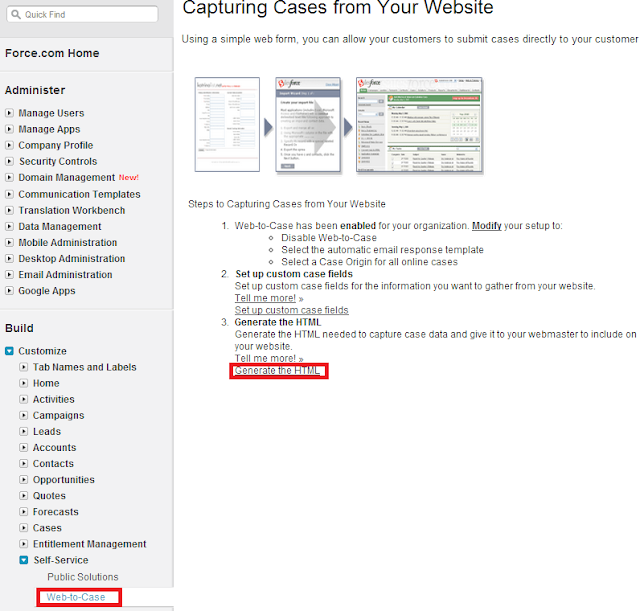 Check the created Case in your Salesforce organization. Using pre-existing pages on our company's website, we can capture contact and profile information from users and automatically generate new leads in Salesforce.com, enabling us to respond in real-time to customer requests. 1. 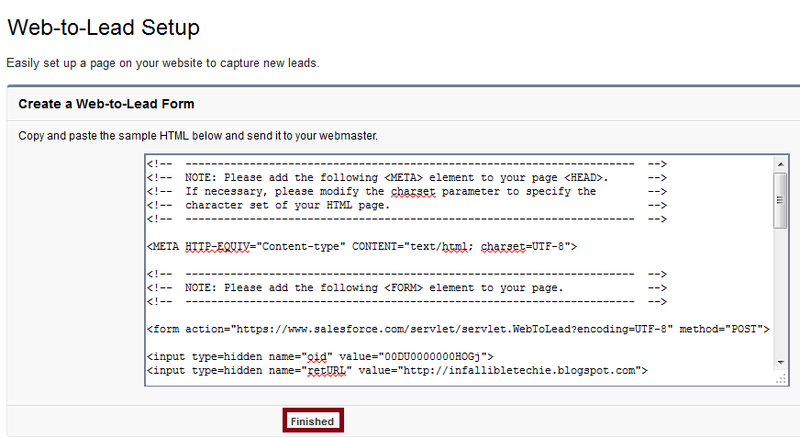 Go to Setup --> Build --> Customize --> Leads --> Web-to-Lead. 2. 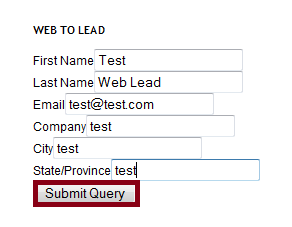 Click "Create Web-to-Lead form" button. 3. Select the required fields and enter the return URL. 5. Copy and paste the HTML generated in your blog or website. 7. 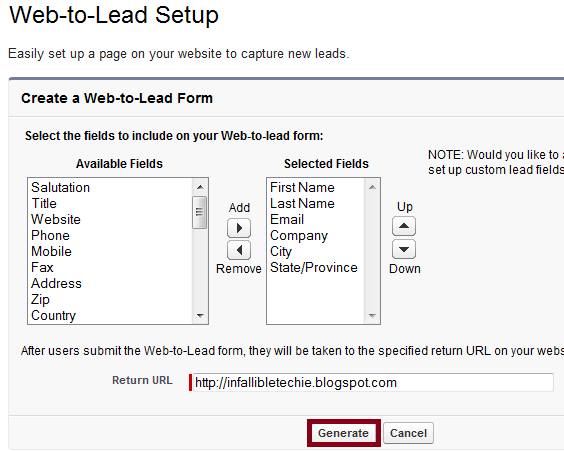 Go to the form created using generated HTML in your blog or website. 8. 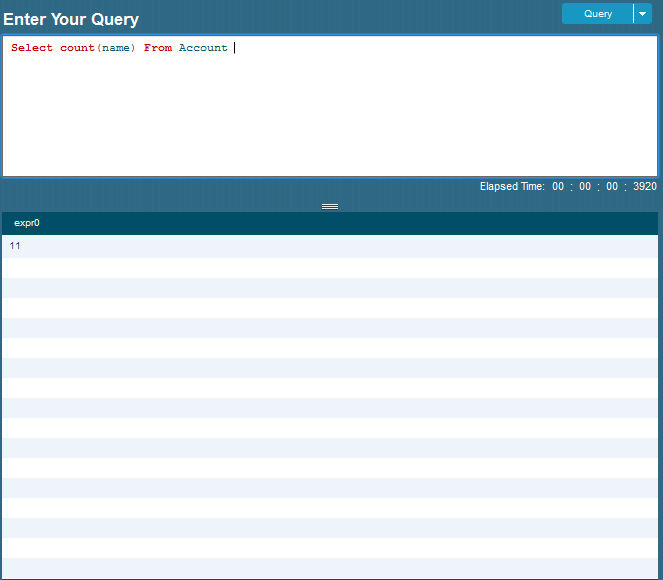 Click "Submit Query" button. 9. 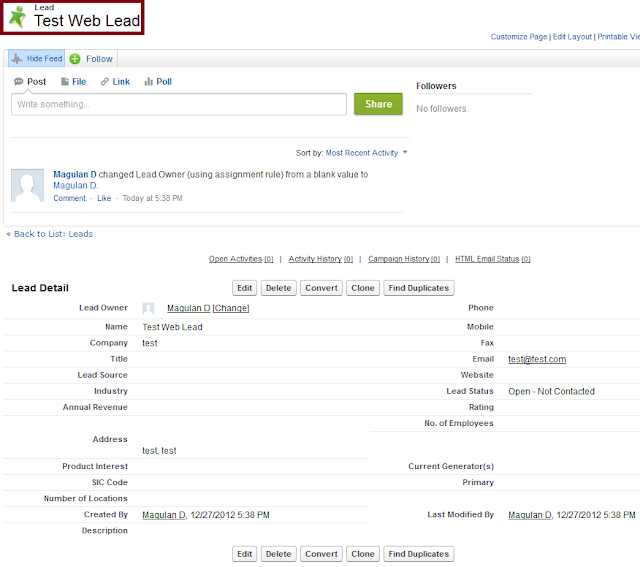 Check the created lead in your Salesforce organization. 1. Check whether you have given the proxy correctly. 2. Check whether you have given the port number correctly. 3. Check whether you have given the correct url(for Production - https://login.salesforce.com and for Sandbox - https://test.salesforce.com). 4. Make sure "API Enabled" permission is checked on the Profile. Field that are aggregated cannot be used in GROUP BY or ORDER BY. In the above example, NumberOfLocations__c cannot be used in GROUP BY or ORDER BY because NumberOfLocations__c is aggregated. - Returns the total number of Account records. 1. If the OWD for account is "Private", is it possible for a user in higher hierarchy to see the records owned by the user below his/her hierarchy? 2. If without sharing class calls with sharing class, how the with sharing class behaves(with sharing or without sharing)? 3. How to extend report access to group of users? 4. How to by pass governor limits? 5. Difference between heap limits and governor limits? 6. How to schedule Batch apex? 7. How to update a text field based on Date field? Apex run time engine strictly enforces a number of limits to ensure that runaway Apex does not monopolize shared resources. The allocation of memory storage for use in a computer program during the runtime of that program. If some Apex code ever exceeds a limit, the associated governor issues a run time exception that cannot be handled. When you create objects in your Apex code, memory is allocated to store these objects. 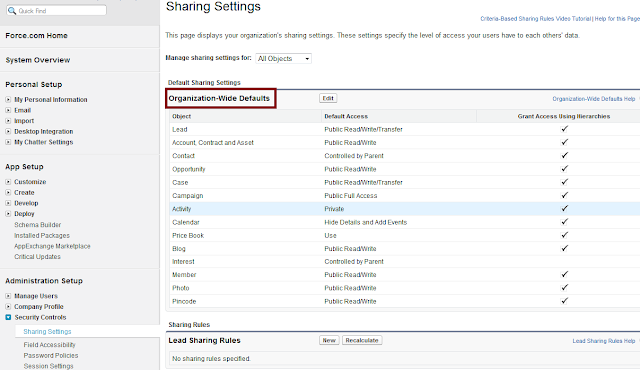 With Sharing - Enforce the sharing rules that apply to current user. Without Sharing - Doesn't enforce the sharing rules. If a class is not declared as either with or without sharing, the current sharing rules remain in effect. This means that if the class is called by a class that has sharing enforced, then sharing is enforced for the called class. // All code in this class operates with enforced sharing rules. // as if the context user has the Modify All Data permission. // returns to without sharing mode. // as the code that calls it. // Inner classes are separate from outer classes. // for the context user, regardless of the class that initially called this inner class. // When the call finishes, the code execution returns to the sharing mode that was used to call this inner class. // this class extends a parent class that ignores sharing rules. While roles and profiles are used to determine the user-based security, the organization wide default determines the distribution of data with the user. We use the defaults in the object to determine which people across the role hierarchy can access which objects. 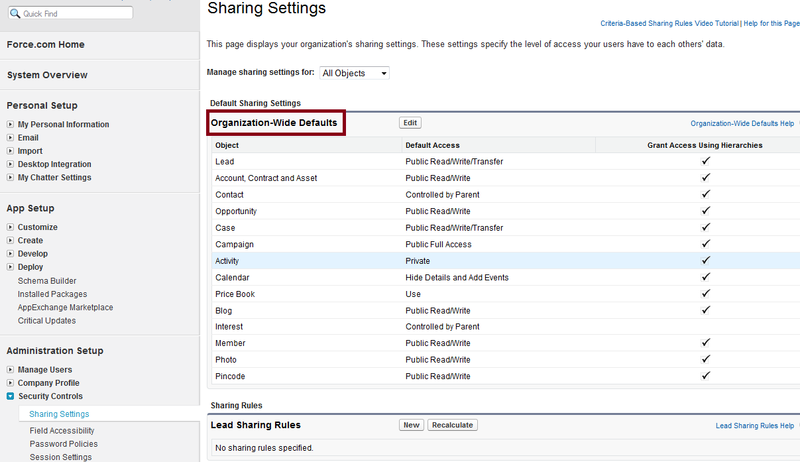 Organization-wide defaults are used to restrict data in the sharing model. In a master-detail relationship, detail records inherit organization-wide defaults from the master record. But in Lookup relationship, parent and child have different OWDs. Go to Setup --> Administration Setup --> Security Controls --> Sharing Settings --> Organization Wide Default. Password policies are user security settings with the password policy for the users. 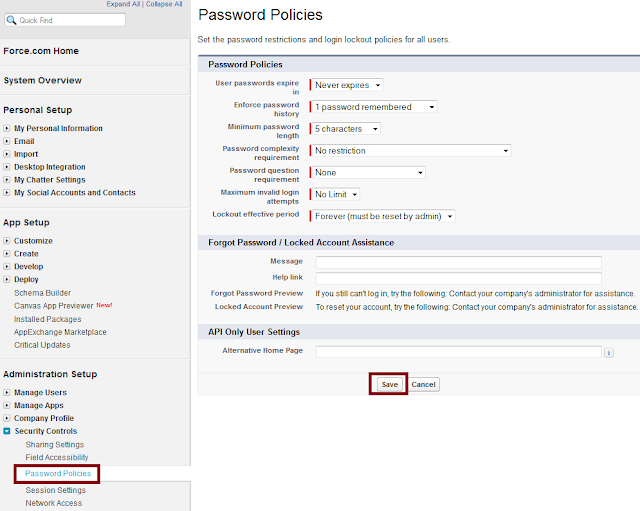 Password policies help us to maintain a strict and complex pattern in password with the automatic expiry. By default Salesforce passwords expire in 90 days and the user cannot use three previous passwords. Passwords are 8 characters in length and should be a combination of alpha-numeric characters. These policies can be changed using the Password Policies settings. 1. Go to User name --> Setup --> Administration Setup --> Security Controls--> Password Policies. 3. The message and help link can be provided to the users in case they forget the password. If the system administrator forgets the password we can reset it using the reset link sent to the e-mail. 4. Click 'Save' button to save the changes. The length of time until all user passwords expire and must be changed. Users with the “Password Never Expires” permission are not affected by this setting. The default is 90 days. This setting is not available for Self-Service portals. Save users’ previous passwords so that they must always reset their password to a new, unique password. Password history is not saved until you set this value. The default is 3 passwords remembered. You cannot select No passwords remembered unless you select Never expires for the User passwords expire in field. This setting is not available for Self-Service portals. The minimum number of characters required for a password. When you set this value, existing users aren’t affected until the next time they change their passwords. The default is 8 characters. The requirement for which types of characters must be used in a user’s password. No restriction—allows any password value and is the least secure option. Must mix alpha and numeric—requires at least one alphabetic character and one number. This is the default. Must mix alpha, numeric, and special characters—requires at least one alphabetic character, one number, and one of the following characters: ! # $ % - _ = + < >. The values are Cannot contain password, meaning that the answer to the password hint question cannot contain the password itself; or None, the default, for no restrictions on the answer. The user’s answer to the password hint question is required. 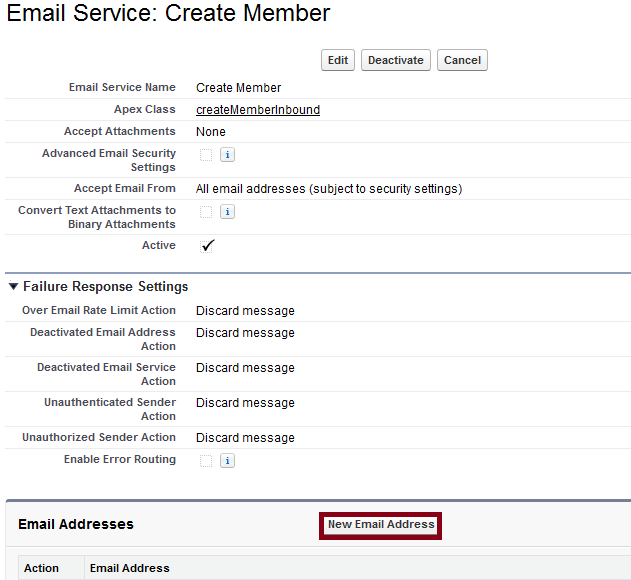 This setting is not available for Self-Service portals, Customer Portals, or partner portals. The number of login failures allowed for a user before they become locked out. This setting is not available for Self-Service portals. If users are locked out, they must wait until the lockout period expires. Alternatively, a user with the “Reset Passwords and Unlock Users” permission can unlock them by clicking Your Name | Setup | Manage Users | Users, selecting the user, then clicking Unlock. This button is only available when a user is locked out. When set, this custom message appears in the Account Lockout email and at the bottom of the Confirm Identity screen for users resetting their passwords. You can customize it with the name of your internal help desk or a system administrator. For the lockout email, the message only appears for accounts that need an administrator to reset them. Lockouts due to time restrictions get a different system email message. 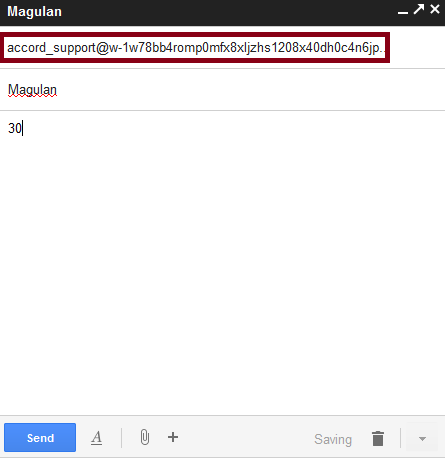 If set, this link displays with the text defined in the Message field. In the Account Lockout email, the URL displays just as it is typed into the Help link field, so the user can see where the link takes them. This is a security feature because the user is not within a Salesforce organization. On the Confirm Identity password screen, the Help link URL combines with the text in the Message field to make a clickable link. 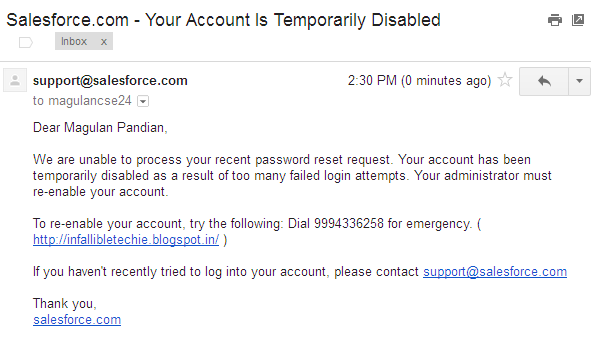 Security isn’t an issue since the user is in a Salesforce organization when changing passwords.